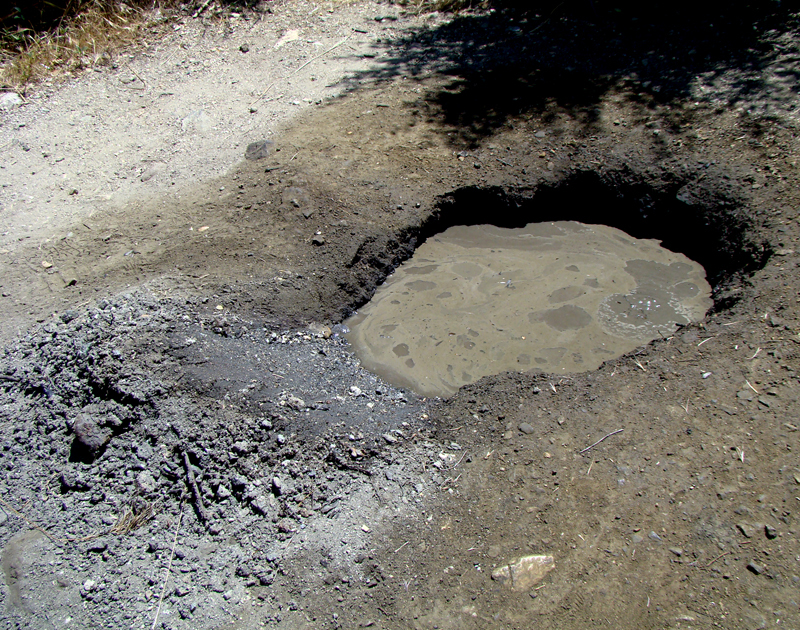 June 2, 2012: Placerita "white oil" bubbles up from the casing of New Century Oil Co. Well No. 1, underneath the present-day Canyon Trail at Placerita Canyon State and County Park. The trail runs between the Placerita Nature Center on the west and the Walker Ranch entrance on the east. The seep is closer to the Walker Ranch entrance than it is to the nature center. It's said that it burns brighter and longer than kerosene. It's so clear, you can read a newspaper through it. You can even put it directly into your car's gas tank — if your car is a Ford Model "T" or Model "A" with its original engine, anyway. Nothing quite like it is known to exist anywhere else in the world. It's Placerita white oil, a unique geologic oddity of nearly water-white, light-gravity oil obtained from wells drilled into metamorphic rocks in Placerita Canyon since 1899 and which continues to bubble up from the casing of an old well below the Canyon Trail inside Placerita Canyon State and County Park. Placerita white oil was an instant phenomenon. Imagine the startled expressions on people's faces when the oil that shot out of that first casing gushed white instead of black! Typical California crude oil, like the type across the valley in Pico Canyon, had to be refined to produce usable fuels. It sold for about $1 per barrel at the dawn of the 20th Century. This stuff in Placerita Canyon didn't need such expensive treatment. Folks figured it could sell for $4 to $5 or more. The oil had been piquing geologists' interest for years by the time property owner Frank Walker sent a sample in 1932 for chemical analysis. Walker had been using his own, home-made "oil-gas-water separator" to siphon the white oil into a drum for direct use. The "gas" that he separated was natural gas, which he piped into his house. The first known test in 1900 showed a calculated gravity of 45.14. Walker's 1932 sample tested out at 37.7. A sample tested in 1967 showed an API gravity of 44.7, and it contained just 0.004 percent sulfur. The higher the API gravity and the lower the sulfur content, the better. West Texas Intermediate crude oil — the U.S. benchmark for oil pricing — is considered "light, sweet" crude because it has a high API gravity of ~39.6 (making it "light") and it's 0.24 percent sulfur (making it "sweet"). That's considerably more sulfur than at Placerita, but it's low compared to other major crude oils. Walker's crude oil tipped the scales in its richness of light-weight fuels. The 1967 analysis showed it to be 83.3 percent gasoline — with a calculated 73 octane rating — and 15 percent gas oil when refined at 400 to 600 degrees Fahrenheit. The figures coincide with the 1900 and 1932 analyses, which showed a total of 99.82 and 98 percent usable product, respectively (even though Walker's 1932 sample had been sitting around and some of the lightest fuels had already evaporated before the sample was tested). And thus, Walker's oil had an incomprehesibly low residuum of just 0.18 to 0.2 percent. Residuum (residual fuel oil) is the heavier oil that's left over after the lighter products (liquid petroleum gases, naphtha, "straight run" gasoline) and medium distillates (jet fuel, kerosene) are boiled off. The higher the temperatures needed, the more costly the refining process; residuum must sometimes be heated to temperatures above 1000 Fahrenheit to be useful. To put it into perspective, Arabian Light crude from Saudi Arabia is about 50 percent residuum. Even West Texas Intermediate, considered the gold standard, is about 33 percent residuum. If somebody could exploit this Placerita product, he'd make a fortune. The argonauts who inadvertently discovered it tried to do just that, as did a few others. A book published in 1900 tells of its discovery: "About six years ago George W. Freeman and Frank Nelson, two prospectors who were sinking for gold in Placerita canyon, were everywhere met by quantities of natural gas, the flow being frequently so strong as to drive them out of their shafts. Finally they decided to cease sinking for gold and drill for oil. "With a spring pole and a small drill they sunk the first well and were rewarded after many hardships and months of patient toil with a fine flow of oil, different from anything ever found in the state, if not in the entire world. The oil discovered was nearly 50 degrees gravity and about the color of ordinary kerosene. It is a marvel to all beholders, as it can be used either for engine distillate or for illuminant without refining. "Other wells drilled with more effective machinery to a greater depth have only verified the wonders of the first strike," claims the author, Lionel V. Redpath. "For several months the output of the wells has continued undiminished." A report on well activity in Placerita Canyon suggests that as of 1900, the only other well that would have "verified the wonders of that first strike" was the first well sunk by the New Century Oil Co. — the source of the oil "seep" along the present-day Canyon Trail at Placerita Canyon State and County Park. The New Century Well No. 1 — and the Canyon Trail — sit about 100 feet downhill from Freeman & Nelson's 1899 discovery well "on adjacent property," according to Redpath. He notes that the Pioneer White Oil Co. had just sunk a well to a depth of 500 feet, with "every indication of success." It showed "great quantities of natural gas," Redpath writes; "a heavy flow of white oil is looked for any day." Redpath appears to have known his remarks were prospective, acknowledging that "at the present time ... there is but one really extensive procuder of oil [in the Newhall area], the Pacific Coast Oil Company" in Pico Canyon. Had Redpath waited a few years, he'd have had a different view of Placerita's potential. But he wasn't alone in his enthusiasm. When the New Century No. 1 well gushed white on Aug. 25, 1900, a magazine published by the prominent Los Angeles writer Charles F. Lummis proclaimed that this "liquid wealth ... gushed above the derricks at the rate of two hundred barrels a day" (Redpath said 100) "and under the pumps is now steadily producing forty barrels a day. The second well of the company is within a short distance of oil sand and the strike is awaited with great interest by stock buyers and scientists alike." If they waited, they grew old doing it. A total of 11 wells were drilled in Placerita from 1899 to 1912 at depths of 457 to 2,100 feet, followed by seven more from 1912 to 1957 with a maximum depth of 2,325 feet. Most came up dry or showed scant traces. Only the two wells already mentioned — the 1899 Freeman & Nelson well (as the Freeman & Nelson White Oil Co. of Fillmore, Calif.) and the New Century Well No. 1 — appear to have produced any measurable quantity. And if they "steadily produc[ed] forty barrels a day," they didn't do it for very long. Most years, they produced just 2.5 barrels per day at best. How did this white oil form? In 1932 there were two theories. Frank Walker's sample showed 52.5 percent aromatics by weight, meaning it had a lot of benzene hydrocarbons. That led researchers in 1932 to consider that perhaps there was some sort of natural distillation going on, the theory being that heat generated by organic material in sediments undergoing lithification (the process of turning sand into rock) could essentially be refining the oil deep underground. That theory was discarded in favor of the idea that the oil was being naturally filtered through the fine sand and clay beds of the Pleistocene-era Saugus formation (Ice Age, 2.5 million to 12,000 years ago) that overlies the so-called basement complex, or Placerita Schist, formed during the Eocene era (56 to 34 million years ago). That's the source of the oil, and that's peculiar. Petroleum hydrocarbons in the other oil fields of the Santa Clarita Valley are younger, originating in sedimentary sandstones and shales from the Miocene (23 million to 5 million years ago) or Pliocene (5 million to 2.5 million years ago). Placerita Creek is bounded by the San Gabriel Fault to the north and the Placerita Fault to the south. The Placerita Fault separates the sandy Saugus formation from the crystalline bedrock. Per the 1932 report: "Oil originating in the Eocene may have migrated along the San Gabriel fault into the Saugus beds ... and thence ... to the Placerita fault. It is possible that such migration occurred before the movement on the Placerita fault was complete, and took place chiefly near the contact of the Saugus and the underlying crystalline rocks." Such filtration "is competent to produce this type of oil," according to the 1932 report. "It is even conceivable that heat generated by movement along the Placerita fault may have resulted in increased pressures and thus have produced somewhat the effect of filtering under pressure." The 1932 report said the "outstanding characteristics of the oil" were its high benzene and low sulfur content, as well as the absence of "heavy ends" (residuum). Those characteristics led the firm that analyzed the 1967 sample to theorize that Placerita white oil might have "a paraffin base as opposed to an asphalt base." Not to be confused with the British usage of the word "paraffin" (kerosene in the U.S.), paraffin hydrocarbons range from light-weight methane (CH4) to heavier octane (C8H18) and mineral oil. Indeed, some modern observers have characterized it as "baby oil" oozing up from the ground. One other historic fact in connection to Placerita white oil should be mentioned. According to local lore, samples of it were displayed at the 1876 Centennial Exposition at Philadelphia. There is no shred of evidence to support this claim, while much exists to refute it. 1. "Placerita white oil: A crude wonder," The Signal, 2-20-2000. 2. "unique geologic oddity" — Seward, Allan E. "Geologic Report: Oil Possibilities in the Vicinity of Placerita Canyon County Park, Los Angeles County," Los Angeles County Department of Engineer, 10-3-1974. 3. "nearly water-white, light-gravity oil obtained from wells drilled into metamorphic rocks" — Brown, Arthur B., and Kew, W.S.W. "Occurrence of Oil in Metamorphic Rocks of San Gabriel Mountains, Los Angeles County, California," Bulletin of the American Association of Petroleum Geologists, Vol. 16 No. 8, pp. 777-785, August 1932. 4. "since 1899" — Seward, op.cit. 5. "continues to bubble up from the casing of an old well" — George Starbuck IV, electronic communication, July 12, 2012: "In reality, it isn't truly a seep but the oil is coming up from the casing of the Centennial well [New Century No. 1]. To the best of my recollection, the top of the casing is only a few feet under the trail pad." 7. Charles F. Lummis, Ed. "Petroleum Versus Petroleum" in "The Land of Sunshine," Vol. 13, No. 6, December 1900. 8. ibid. ; and Redpath, Lionel V. Petroleum in California. Self-published 1900, Los Angeles, pg. 48 ff. 9. Brown and Kew, op.cit. 10. Oil-Gas-Water Separator, courtesy of George Starbuck IV on SCVHistory.com (n.d.). Per Starbuck (electronic communication July 12, 2012), a brush fire that denuded the foliage in Placerita Canyon in the early 1960s — probably 1961 — was followed by a winter rain that caused a landslide. The mud "wiped out the road leading up to the well. At that time, the water-oil-separator was still in place, so it's probably under a ton of soil." 11. Lummis, op.cit. Chemical analysis performed by J.M. Curtis & Son of San Francisco. 12. Report of Determinations (Letter) from Smith-Emery Company, 8-16-67, included in Seward, op.cit. 14. Brown and Kew, op.cit. Walker's sample yeilded 98 percent usable product when heated to a maximum of 594 degrees. 15. 0.18 percent residuum for the 1900 sample (Lummis, op.cit. ); 0.2 percent residuum for the 1932 sample (Brown and Kew, op.cit.). 17. Included in Seward, op.cit. 18. Starbuck, op.cit. at 5. 19. ibid. Per Starbuck, the 1899 Freeman & Nelson discovery well was located about 100 feet uphill from New Century No. 1. It was accessed by a narrow-gauge funicular railway. 22. ibid., referring to the 1899 Freeman & Nelson discovery well. According to a record included in Seward, New Century No. 1 produced 43-gravity crude, but the quantities are not stated. 23. Brown and Kew, op.cit., referencing general research (not specific to Placerita) by Brooks, Benjamin T., "Chemical Considerations Regarding the Origin of Petroleum," Bulletin of the American Association of Petroleum Geologists, Vol. 15 No. 6, pp. 661-627, June 1931. 24. ibid. It should be noted that Seward (op.cit.) states that Brown and Kew (1932) determined Placerita white oil was formed through natural distillation. That is incorrect. Brown and Kew concluded that of the two theories, "the theory of filtration offers the more plausible explanation." 25. Brown and Kew, op.cit. ; and Seward, op.cit. 28. Starbuck, a younger Walker relative, said he "knew about the paraffin base because after filling the (car's gas) tank, I'd wet down a rag and polish the paint. Talk about dangerous!" (Electronic communication, July 12, 2012).